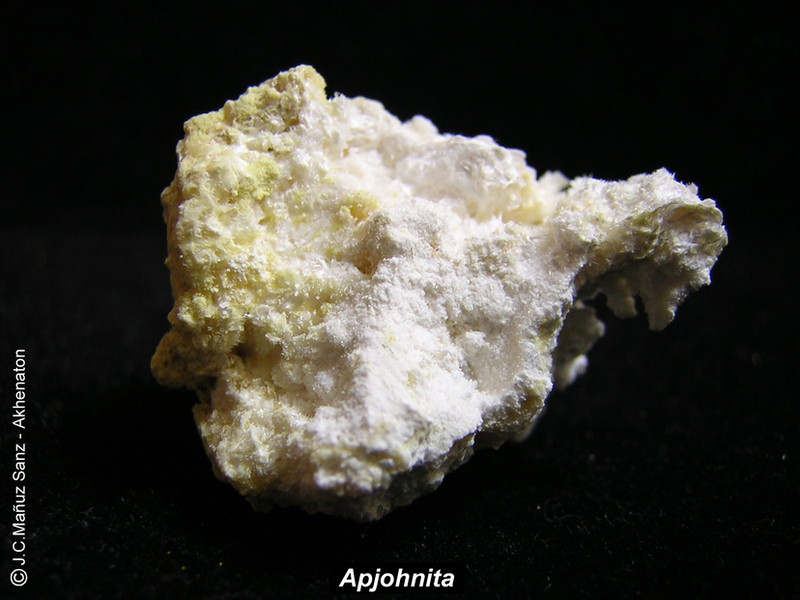 Apjohnite: Mineral information, data and localities. Colourless, white, light pink, light yellow, light green. Named in honor of James Apjohn (1 September 1796, Ireland - 3 June 1886, Blackrock, Co. Dublin, Ireland), Professor of Chemistry and Mineralogy, Trinity College, Dublin, Ireland. His birthplace is listed from different sources as Granard, Co. Longford and Sunville, Pallasgrean, Co. Limerick. 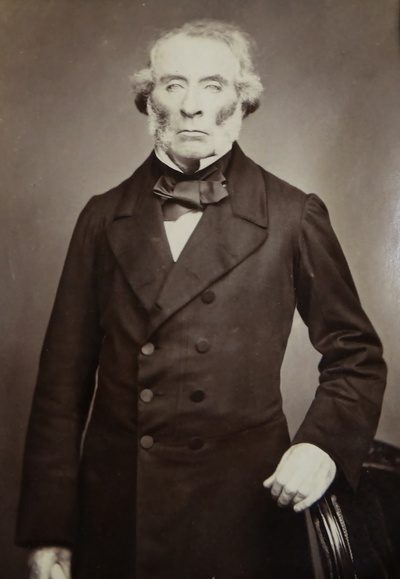 He made contributions in the areas of chemistry, electricity, and mineralogy, and first described this mineral. At least a partial (and probably a complete ?) 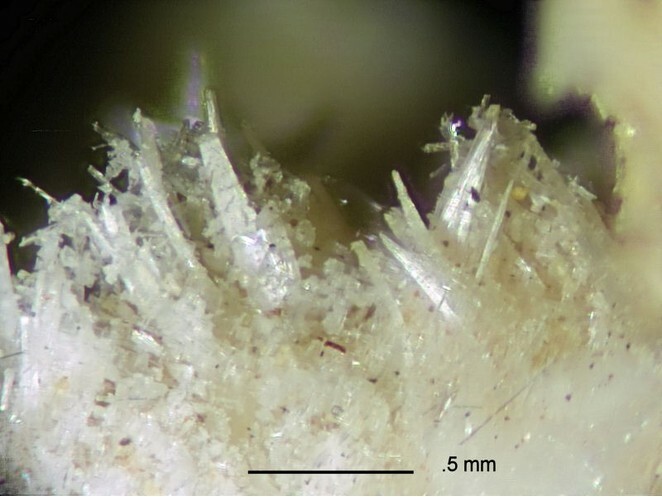 series toward Apjohnite exists from Pickeringite and Halotrichite. Crystals acicular aggregated into masses and crusts; also asbestiform. Magnesiocopiapite 1 photo of Apjohnite associated with Magnesiocopiapite on mindat.org. 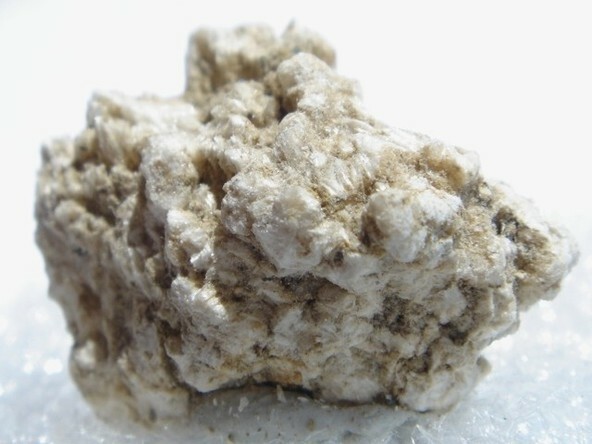 Ilesite 1 photo of Apjohnite associated with Ilesite on mindat.org. Kane, R. (1838) Ueber der Wirkung von Arsenikwasserstoff auf schwefelsaures Kupferoxyd und über den vom Dr. Apjohn zerlegten Mangan-alaun. Annalen der Physik: 44: 471-472. Glocker, E.F. (1847) Ordo XVIII. Hydrolyti. I. Hydrolyti ametalli. 24. Halotrichites. Appendix. Apjohnites. Generum et specierum mineralium secundum ordines naturales digestorum synopsis, Apud Eduardum Anton, Halle, 288-304. Ludwig, H. (1870) Ueber den haarförmigen Manganalaun und das manganhaltige Bittersalz vom Boschjemansflusse. Archiv der Pharmacie: 193(2): 97-100. Brown, W.G. (1884) A new hydrous manganous aluminic sulphate from Sevier Co., Tenn. American Chemical Journal: 6: 97-119. Kokta (1939) Sborník Klubu Příroda. : 19: 75 (Min. Abs. : 7: 316 ). Palache, C., Berman, H., Frondel, C. (1951) The System of Mineralogy of James Dwight Dana and Edward Salisbury Dana, Yale University 1837-1892, Volume II. John Wiley and Sons, Inc., New York, 7th edition, revised and enlarged, 1124 pp. : 527-528. Menchetti, S., Sabelli, C. (1976) The halotrichite group: the crystal structure of apjohnite. Mineralogical Magazine: 40: 599-608. Ballirano, P. (2006) Crystal chemistry of the halotrichite group XAl2(SO4)4 · 22H2O: the X = Fe- Mg-Mn-Zn compositional tetrahedron. European Journal of Mineralogy: 18: 463-469. Krivovichev, S.V. (2013) Structural complexity of minerals: information storage and processing in the mineral world. Mineralogical Magazine: 77: 275-326. Frost, Raymond L. and Locke, Ashley J. and Martens, Wayde N. (2007) Thermal analysis of halotrichites. Thermochimica Acta 459(1-2):pp. 64-72. Palache, C., Berman, H., & Frondel, C. (1951), The System of Mineralogy of James Dwight Dana and Edward Salisbury Dana, Yale University 1837-1892, Volume II: 528; Mineralogical Magazine (1976): 40: 599. Zhdanov Yu.Ya., Solov'ev L.I. (1998): Geology and mineralogical composition of the oxidized zone in the Deputatsk tin ore deposit. Otechestvennaya Geol. (6), 77-79 (in Russian).